News - HDBaseT Receiver | Aurora Multimedia Corp. 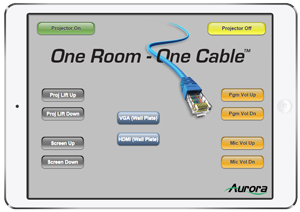 This receiver completes the picture when it comes to a One Room – One Cable application. In addition to the onboard RS232 and IR outputs, the DXE-CAT-RX3C-A incorporates screen/lift control, external audio inputs from mic/paging systems w/mix level control, a balanced audio output for DSP processing/lecture recorder as well as a powerful stereo room amplifier for in-room Ceiling speakers. All of this can be easily accessed and controlled with the embedded Web Control Engine from any tablet or web-based device. The DXE-CAT-RX3C-Aputs all this power at the display. Perfect for Classroom, Conference room and AV-Cart applications.